Fake News? From Our Garden? I went walkabout in the garden yesterday, taking stock of what needs to be done (Yikes!) and getting a glimpse at how the perennials are coming along. To say it was a confusing half hour is putting it more mildly than our spring weather! Or maybe it’s just my memory. The hyacinths that once bordered the garden beds around the house have burst their boundaries and are filling in every available “empty” spot. Not a problem but… aren’t they a month or so late? It seems to me that they are usually intertwining with the first show of primroses early in March. 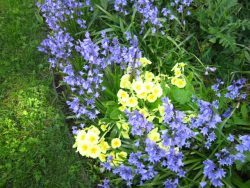 But, this year the primroses have been brightening the beds for some time — all by themselves. Hyacinth’s supporting cheer came late. On the other hand, Mrs. G.W. 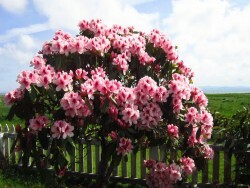 Leak – that saucy rhododendron with the lovely pink petals and mysterious dark center – is bursting forth down near the east fence. I think she’s at least a month early. 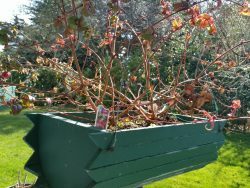 Don’t we usually pick armloads of that showy flower to take to the cemetery on May 30th? This year, though… highly doubtful. 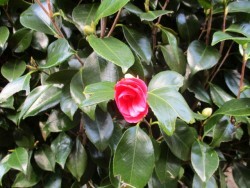 And how about my “birthday camellias?” Finally, they are blooming! Six weeks later than usual! 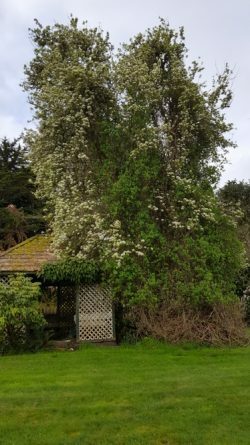 The lilacs and honeysuckle, however, look to be right on schedule – both whispering promises of being here before summer — and the old (100+ years) pear tree is blooming to beat its record. As for the lupine and day lilies and fern and buttercup – trying to take over, as always. Some things don’t change… But just what month do they think it is, anyway? Those plant people are pretty confused, if you ask me. All-in-all, I think the garden is on a bit of a bewilderment rampage. Perhaps it can be compared to the fake news phenomenon coming from the other Washington. It’s hard to know what to count on or how to plan. The only obvious recourse is to get out there and try to sort the chaos and conflict from the normal and hoped for. And, of course, to enjoy whatever pleasant surprises I might find amongst the familiar. Saucy Hummers — Back with a Vengeance! 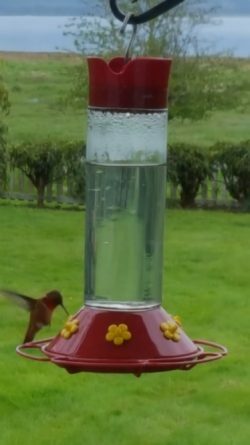 We, too, have been enjoying the return of the rufous hummingbirds at our feeder. They must have come back while we were in Portland at the hospital because, by the time we got home two weeks ago, they had re-established themselves among the resident Annas and it is (mostly) calm at the feeder. 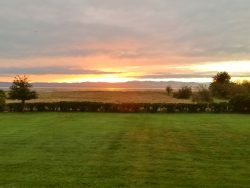 In the early morning, as the sun is just peeping over the Willapa Hills, they are already distributing themselves around the six feeder stations. Other little hummers vie to be next in line. Where do they all go at night, anyway? We probably should get another feeder, but we don’t have a handy hanging spot – not one that we can readily see, that is. Probably the height of selfishness, eh? 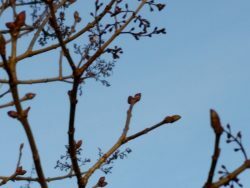 Later in the day, I see the little birds at the barberry by the south gate, checking out the camellias near the east porch, and sitting on the branches of the ready-to-burst-into-bloom- lilacs dotting the property. I’ve often thought that their nests must be somewhere in the lilac bushes. There are so many convenient little crotches made by the branches that seem just the right size for a tiny cup-shaped nest. So far, though, I’ve not seen one. Not here in Oysterville. Years ago, in California, we had an atrium that included, among the plantings, a lovely dwarf Japanese maple. The same hummingbird family came there every year – at least I think it was the same family – and refurbished their tiny lichen-covered nest. The female laid two white eggs, smaller than jellybeans, and raised those buggy-looking babies with the love and devotion that only a mother could give such unprepossessing-appearing offspring. But… they fledged into beautiful Annas and I was always sure that their parents would have been attentive no matter what. Once, before it became a known health hazard, I was sunbathing on my deck and watched as a humming bird settled herself on my outstretched arm. Had I not been watching, I’d have never known she was there. She seemed weightless and I felt blessed to be chosen as her resting place for those few precious seconds. I don’t know about these Washington hummers, though. More than once they have flown from window to window and room to room, hunting us down and buzzing at us through the pane to tell us the feeder needs refilling. Saucy little bits of blurs and beaks! I never tire of watching them. The sunshine began calling early yesterday morning. By noon, Nyel had positioned himself (in his wheelchair) in the kitchen so that the sun was beaming through the window right onto his face. There he sat, smiling and reveling in the warmth and the light. “Let’s get you outside,” I said at lunch. 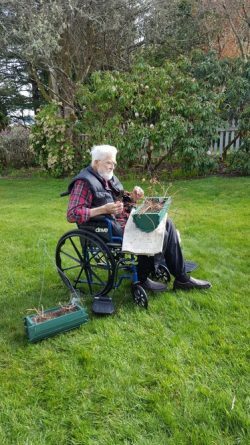 “I think we can do it – between your walker and the wheelchair, I think we can manage the step from house to porch and from porch to lawn. Don’t you?” He did and so off we went. It all worked like a charm! We were outside for about two hours. Maybe more. There was a steady stream of visitors who, seeing the “Temporarily Closed” sign on the church, read the bronze plaque in the churchyard instead, and tried to figure out how to pronounce the “Tsako-te-hahsh-eetl” sign over our gate. Neighbors Mark and Sandra came by on their walk and hung over the fence to visit a bit. A duck or two flew overhead. 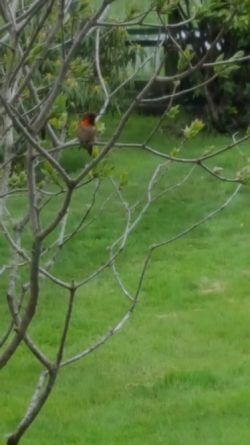 The roosters crowed every now and then and the hummingbirds came by to say “thank you” for refilling their feeder. It was all absolutely perfect. Weather, Climate Change, or Deer People? For sure the Deer People (as Nyel calls our hoofed ruminant friends) have been super active in our yard this year. We know that because they have left their calling cards EVERYwhere and have eaten every bit of deer candy within reach – roses bushes, apple twigs and branches, primroses, camellias, tulip (we only have one – a volunteer who didn’t know better) and probably a lot of other stuff we’ve not yet discovered. The only thing that I really dislike sharing are the camellias… they have a special place in my heart. I know that weather cycles come and go. I know that we are in the midst of serious global climate change. And, I know that the deer people are more prolific now than they were in my childhood here. Undoubtedly, one of those factors has to do with the blossoming time for our camellias… I don’t really care about a definitive answer… yet. As long as they keep blooming, I can celebrate my camellia birthday after or before or during my natal day. Whenever it is, I’ll think of my mom! Ten hanging baskets of fuchsias and ten fat clay pots of geraniums adorn our south porch. They have been there every year from spring until mid-fall since 1972. 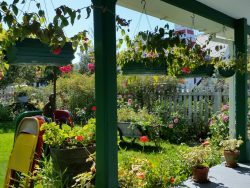 That’s when my folks retired here to mom’s family home and dad began working his magic with the garden – which extended, of course to the pots and baskets on the porches and the climbing Dorothy Perkins roses on the fences. 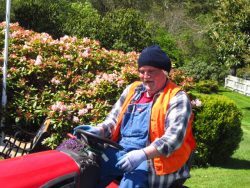 Since 1998 when we moved in, Nyel, in his turn, has been the garden steward. My job is to clap and cheer. And to weed. But I don’t touch those porch plants except for occasional watering. (If reminded.) Usually, in October, Nyel cuts back the fuchsias and gives them a good soaking and hangs them in the garage for the winter. This year, though, he broke his leg, and was ordered off his feet for three months so… the baskets remain as they have been for over a year. 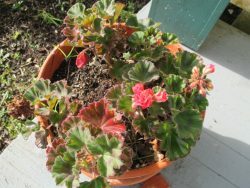 Ditto the pots of geraniums, though we usually don’t take them inside. Sometimes the plants winter over; sometimes not. We thought about having me bring one basket at a time inside, having Nyel trim and water, and then me carting them to the garage and hanging them on the ceiling rack made for the purpose. Great idea but… I’m just too wimpy. I can carry one basket at a time… barely. But lifting that same basket dripping with water… forget it! So, the fuchsias join the geraniums in the wait-and-see mode. Even if some of them make it, I’m afraid they will not be things of beauty. Nyel is a great trimmer; Mother Nature, not so much. Not with porch plants, anyway. We have decided to consider it all a test. If things turn out well, no telling how slothful we may become. 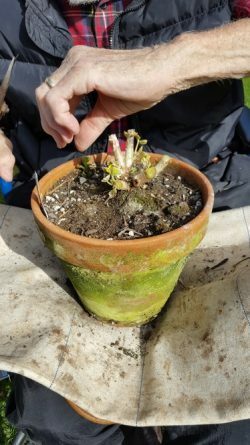 But, if the results are bad, we may have to rethink the porch plant thing – especially if Nyel continues breaking all the parts of that pesky leg! With apologies to Dad, of course, and to Hank Batten who was his right-hand garden helper. 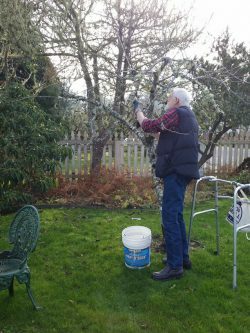 January is a good month for pruning fruit trees but, even so, I was thrown a little off-center yesterday when Nyel said he was going out to work on our apple tree. I might have raised my voice – just a little. “I’m using my walker,” he said. And he did! What a guy! Fortunately for all concerned, I was busy with a big project of my own and so I didn’t have time to hover. In fact, I didn’t give much thought to Nyel or his endeavor until he was almost finished, just in time to get a picture or two. I gave the universe a fleeting “thank you” for the fact that it is a dwarf tree and Nyel can reach even the highest branches. And I praised El Niño for providing us with a warm, mild winter. All conditions were perfect and the task was accomplished without incident in almost nothing flat! While I was cheering and clapping, I took a few minutes to consider the rest of our garden. For the middle of winter, it’s looking good. 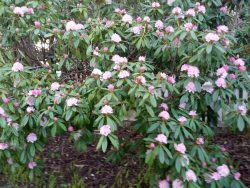 The lilacs are leafing out, the hyacinths are pushing up, and our winter-blooming rhodies are in full blossom. I do wish I knew their name. They are not my favorites, blossom-wise, but they cheer me up every year when our garden is dominated by winter greens and grays. Speaking of cheering, our weather has been spectacular. The warm dry winter of El Nino translates into sun and blue skies and mild temperatures (in the 50s today) here in Oysterville. My heart goes out to our friends in the northeastern and southern states who are dealing with “Winter Storm Jayden” and other dreadful “weather events.” I try not to linger on that too much… overwhelming outrage at the climate-change-deniers and our current administration’s suicidal policies make me crazy. On the other hand, I’m clapping and cheering with the news that Germany plans to close all 84 of its coal-fired power plants and will rely primarily on renewable energy by the year 2038. I doubt if I’ll be around to see it, but if enough other countries follow suit, there may be someone, even here in Oysterville, who will reap the benefits. Heady thoughts, eh? You can’t ever tell where a simple pruning effort will lead, at least in the Thinking Department! Go, Farmer Nyel! 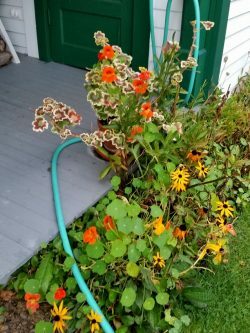 After a week of spectacular weather, the cloudy (sometimes drippy) weather of yesterday seemed like a final punctuation mark to summer. 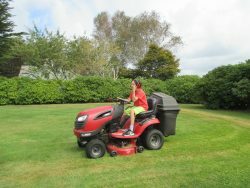 Both Nyel and I succumbed to unusual urges – to clean and tidy up the garden and to finish up a few almost-completed outdoor projects. The weatherman tells us to expect more of the same all week so I hope time and energy continue to cooperate. 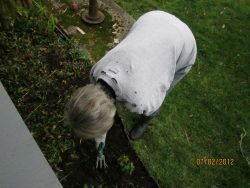 As I hunkered in the flower beds, clipping and pulling, I could hear a wedding party gather across the road. For about an hour they talked and laughed and enjoyed one another as they posed for photographs before going into the church. It was such a peaceful, happy gathering! Another lovely ending to the season, perhaps – although, there may yet be other weddings before the year is out. I can’t imagine, though, that they could be any more joyous than this one sounded. Also, as I worked, I heard gunshots to the south. It’s early for duck season plus it didn’t sound like shotgun shots. It’s early for deer. as well. Nor do I think there’s deer hunting so close to Oysterville, as far as I know. Maybe someone doing some target practice? Hard to tell. But it served to remind me that duck season isn’t far off and that familiar pop-pop-pop of the hunters’ guns will soon let us know that autumn is underway. I’m already making mental lists of Fall Projects that we should see to. I’m promising myself that this year I’ll dig up and sort the dahlias – we have a plethora of pink ones that need to be thinned and some gorgeous purple ones that, I hope, can be divided and moved to more advantageous spots. 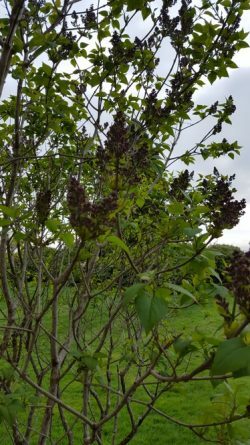 And there are a few things that didn’t get our attention this summer – a lean-to for our firewood, for instance, and perhaps a start on repairing the gazebo. Both of those are in Nyel’s bailiwick and I stand ready to clap and cheer if he makes moves in those directions. There’s always more to do than time or energy or money warrants. I’m never sure if that’s a bad thing or a good thing. In general, though, I guess looking forward to continued accomplishment is positive – even if it is only one tiny step at a time. Already? How did we get here so fast? Here we are – the last day of summer in the year of our lord 2018. It’s been lots of fun and lots of work for me, more-or-less in equal measures. Even the “work” part – finishing up a book, beginning a new series for the Observer – has been fun. ‘Field trips’ with Carol and Tucker have been fun. All the summer visitors have been fun. My only complaint about this summer: there were many too many things I wanted to do than the days – even the longest ones – gave time for! 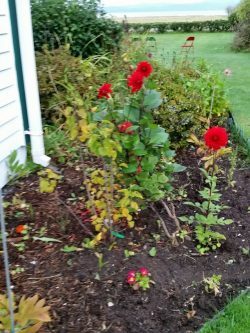 Especially neglected was our poor beleaguered garden. 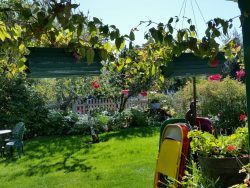 Even though the aftermath of our new septic system is on the north side of the house – a side we have to go to fairly purposely to contemplate – it has somehow skewed my attitude toward the garden in general. All that dirt where the lawn used to be. And now all those struggling shoots of new grass. My heart just hasn’t been in the out-of-doors. On the other hand, I think I find some excuse or other every year about this time. It’s apparently hard for me to come to grips with the “I don’t like gardening” concept. 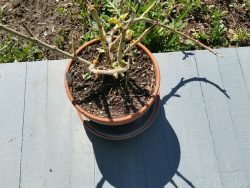 However, I have been out there these past few days trying to prune back our Dorothy Perkins roses. I’ve managed to get about halfway along our west fence and probably just need a couple more three-hour blocks of time (that’s all my old bones can manage in one go-round) to finish it up. Part of the ‘trouble’ with forward progress are the other things that call my attention along the way. The spent tiger lilies in the bed where I’m standing and the blankety-blank morning glory twining around the dahlias block my path and cause mega-diversions. Actually, sometimes I’m glad for those distractions. There is only so much snagging and scratching and ouching a body can withstand when it comes to rose-wrestling. But, so far, the weather has been glorious. The passing parade of tourists has been interesting. And my timing usually coordinates with Cappy’s desire for a walk so Carol and I can have a little visit over the fence as neighbors are said to do in little villages like ours. All very Agatha Christie, but not in a murder mystery sort of way. Bottom line – I’m not really ready for Fall. Not that anyone asked. …singing every stretch of the way! (Well, I was; Nyel doesn’t sing.) If you are a “Double J and the Boys” fan, you know Judy Eron’s wonderful song of revenge, “I Picked His Plum Tree Bare.” It can easily work its way into your head and become a serious earworm without any provocation at all. But, when you are actually picking plums, singing that song becomes an unequivocal imperative. This was a first-ever experience for us, even though that plum tree is more than a decade old. 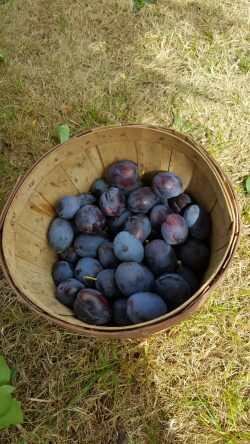 We got it – a dwarf Italian Prune Plum – along with our two apple trees and planted them all on the south lawn. I guess we were thinking “orchard” but soon realized, as did the trees, that it wasn’t a fruitful (ahem!) idea. All three of the trees developed problems. The plum tree seemed the healthiest and was definitely the most pleasing to the eye. But, as the years went by and it was producing no fruit at all, Nyel got disgusted and moved it out into the back forty. It has been one of those out-of-sight-out-of-mind things and it wasn’t until a few weeks ago that Nyel noticed a young plum. No! Wait! Lotsa plums! Yesterday, we decided it was time to harvest. 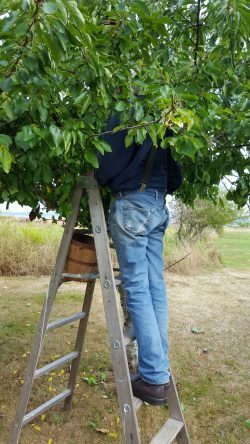 Both of us are beyond our ladder-climbing years, but it is a dwarf tree, after all… So, between the two of us (and following the no-climbing-beyond-the-third-rung rule) we emulated our friend Judy. We picked that plum tree bare! Nine and a half pounds of gorgeous plums hidden among the foliage. Hard to see. Tricky to get to. But apparently undisturbed by deer or birds or tourists. And, they are plum delicious! !